Walk into Vikki Spruill’s office with its views of Central Wharf and the Rose Kennedy Greenway, and—apart from Boston Harbor—the first thing to catch the eye is a sign she placed on her bookshelf her first day as President and CEO of the New England Aquarium: If your ship hasn’t come in, swim out to it. It’s exactly what Spruill has been doing her entire life. An Army brat who moved around the globe as a child, she spent her high school and college years primarily along the Gulf Coast. It’s there she fell in love with the oceans at a young age and wanted to become a marine biologist. It was a dream she shared with her high school science teacher. “He told me there wasn’t a place for women in the sciences,” said Spruill. Spruill eventually took her communications degrees and years of experience in strategic communications and marketing to The Pew Charitable Trusts, where she founded and led SeaWeb. This innovative initiative promoted the intersection of marine science with strategic communications and policy. Later, she co-founded COMPASS, which helps scientists more effectively communicate environmental issues to policymakers, media, and the public. She raised her profile and overall awareness of ocean conservation, science translation and communication, and policy advocacy and philanthropy in her roles as President and CEO of such powerhouse organizations as Ocean Conservancy and, most recently, the Council on Foundations. 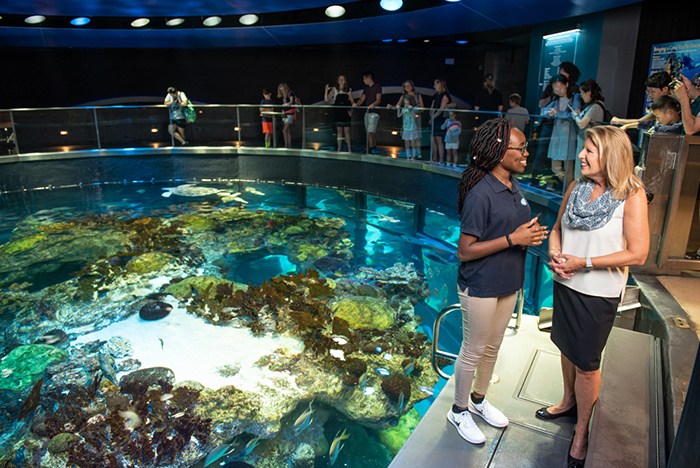 Aquarium President and CEO Vikki Spruill talks with teen intern Chika Chukwu at the top of the Giant Ocean Tank. 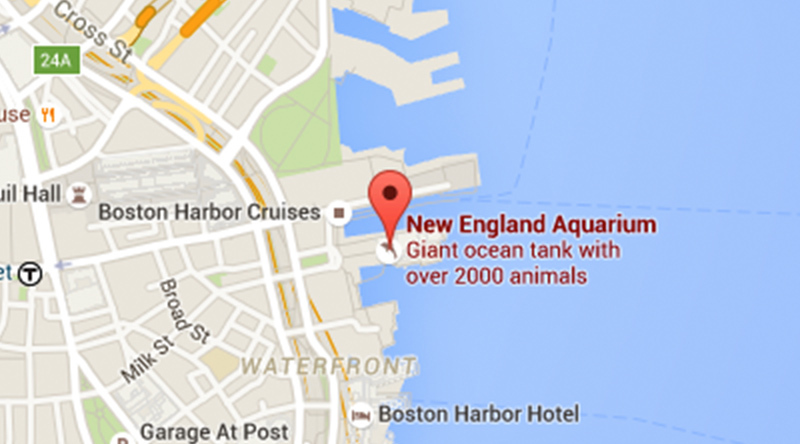 So why the New England Aquarium and why now? Spruill said she believes the public and policymakers are eager to contribute to ocean conservation actions, but people often don’t know where to start. 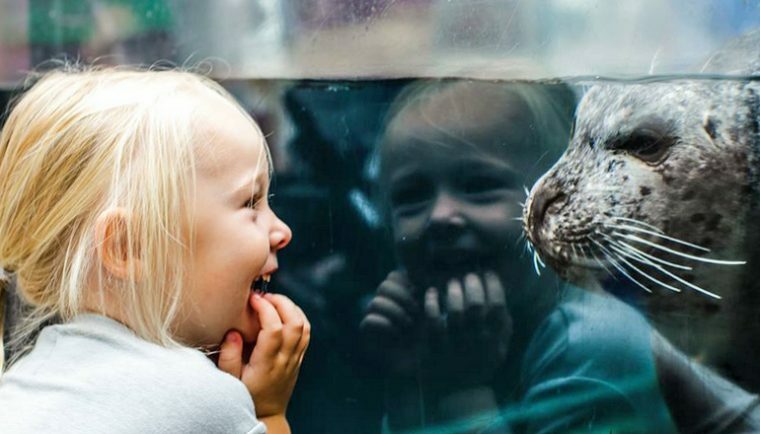 She cited an Association of Zoos & Aquariums survey that showed more than 181 million people visit aquariums and zoos each year— more than the combined annual attendance of the National Football League, Major League Baseball, National Hockey League, and National Basketball Association. 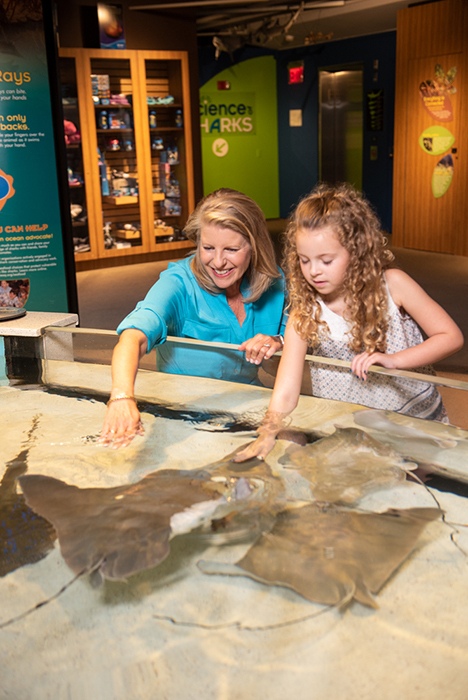 Vikki Spruill waits for a passing ray alongside a young visitor at the Trust Family Foundation Shark and Ray Touch Tank. 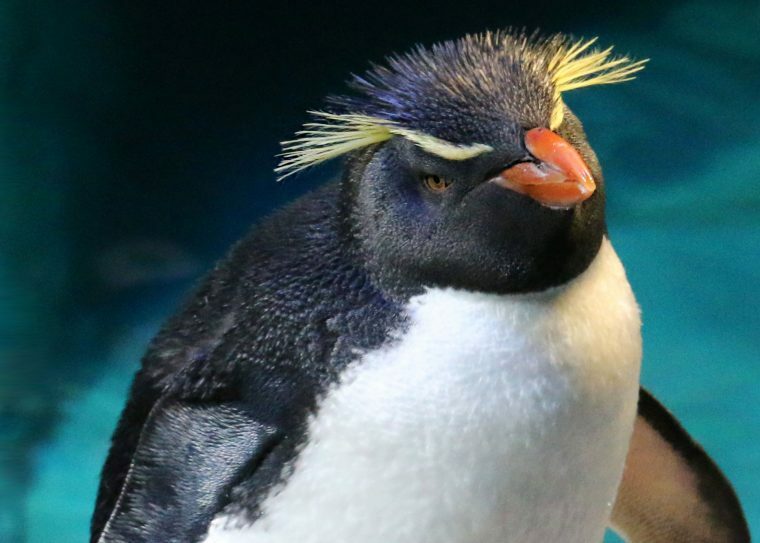 Julie Packard, longtime Executive Director of the Monterey Bay Aquarium in California, believes Spruill is just the person to help give that direction. 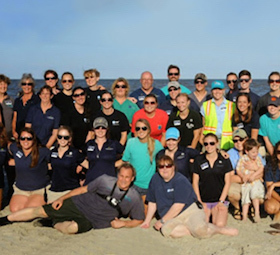 “Vikki has been a real leader and innovator in the cause of ocean conservation. What distinguishes her contributions to this field has really been her focus on marketing and communications, and her ideas about influencing the public about change,” said Packard, who has worked with Spruill on behalf of the oceans for decades. But it’s not simply Spruill’s communications skills that make her the perfect fit for the Aquarium, it’s how she builds partnerships and communities within communities to turn words into action. And that means addressing climate change. “I don’t think there’s a more important issue than climate change—globally, nationally, and locally,” said Spruill, noting the oceans are at a pivotal juncture when it comes to climate change. We have got to come to grips with climate change and deploy mitigation and resilience strategies. 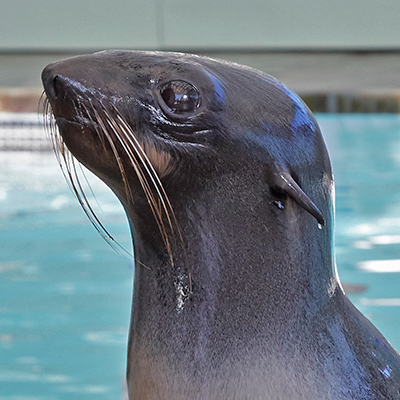 The Aquarium can help, we have an obligation to raise awareness for why it matters.